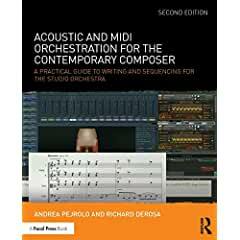 Focal Press has published Acoustic and MIDI Orchestration for the Contemporary Composer: A Practical Guide to Writing and Sequencing for the Studio Orchestra, 2nd Edition. This book provides effective explanations and illustrations to teach you how to integrate traditional approaches to orchestration with the use of the modern sequencing techniques and tools available to today’s composer. By covering both approaches, Pejrolo and DeRosa offer a comprehensive and multifaceted learning experience that will develop your orchestration and sequencing skills and enhance your final productions. - A new final chapter on writing and production techniques for mixed contemporary ensembles. - All new techniques, tools, and sound libraries available to today’s composer. A companion website includes a wide selection of audio examples, templates, sounds, and videos showcasing operational processes, allows you the opportunity to listen to the techniques discussed within the book.